Let's Make South Florida Schools Trauma Informed by Endorsing TIS Leaders! This is Natalia Garceau from Broward County, FL. Last February, in Washington, DC, l met so many wonderful, caring educators from all over the United States and abroad at the first ATN Conference for Creating Trauma-Sensitive Schools. Sadly, I was the only person from South Florida, and I was not sent to DC by my school district. I came there on my own to learn newest strategies of how to help traumatized children since I've been working with at-risk juveniles in an alternative school in Hallandale Beach, FL for the past nine years. I have to let you know that even now, four months after the Marjorie Stoneman Douglas shooting, trauma awareness is still not on Broward School Board's agenda. No trainings for teachers or administrators. No trainings for students or parents. Since the beginning of the investigation of the school shooting (19-year-old Nikolas Cruz shot and killed 17 people), it became obvious that there's a lot of corruption and negligence in our school system, Broward Sheriff's Office and other organizations who were providing services to the mentally ill child and who were responding to the crisis. On top of that, Broward County Public Schools Superintendent Robert Runcie received a "highly effective" evaluation from the majority (six out of nine members) of the School Board of Broward County and a raise after the incident. No teachers who risked their lives savings their students or those who died as a result of the shooting were rewarded or recognized. 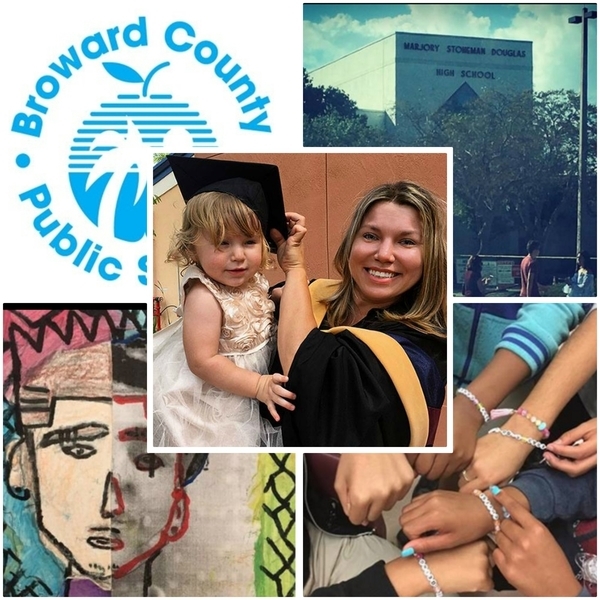 BCPS Principal whose daughter got killed in the shooting was denied a personal leave to grieve and prepare for the funeral of her child by Superintendent Runcie. Our Superintendent now makes almost 400,000 dollars, more than Florida Governor, more than the Vice President of the USA. Those of us who criticize Mr. Runcie's lack of competence and empathy and his negligence on social media are being blocked from posting on his official Broward Schools accounts. Our Broward Teachers Union leader Anna Fusco advises us to not speak with media because, according to our contract (approved by the BTU), teachers are not allowed to contact media and discuss school business. Breaking the contract may lead to teachers being fired from their jobs in Broward Schools. In Broward County, we are also prohibited from going on strikes. After much consideration, I decided to run for the seat on the school board for District #1 that includes Hallandale Beach, Hollywood, Dania Beach, some areas of Miramar and Pembroke Pines in South Florida. I have never thought of doing this before, but at this time I feel compelled for I can no longer witness the atrocities in our school system. I feel morally obligated to do something about this. I would like to ask the ACEs Community to endorse me and offer your advice in regard to my campaign and your positive experiences related to creating trauma-informed and trauma-sensitive schools in your school districts. I would also like to ask for your contributions towards this campaign. At his challenging time, Broward Schools need a positive change. We "have" to bring trauma awareness to South Florida. I'm not a politician and have never aspired to be, but someone has to do this job. Thank you for supporting yet-to-be-trauma-sensitive Broward County Schools!